Good morning, all! 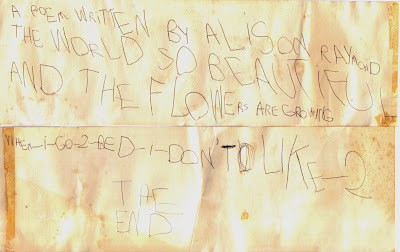 To start off the week, here is some poetry from a very young, teenage Alison Raymond. The assignment in class (Kasey and Courtney, remember Mrs. Hamilton?) was to pattern a free-verse poem after Walt Whitman’s “There was a Child went Forth.” Walt Whitman’s personal life doesn’t make me a fan, but his writing style wasn’t too shabby. Anyway, the first four lines had to be verbatim from his; the rest is mine. Our class was told that the poem was intended to reflect the writer’s memories/images/influences up until that point in life. These things became a part of her. Each was saved and treasured in her heart. determined to absorb every magnificent, minute detail. Apparently I’ve now joined the 21st century. At times I’ve read the first posts on others’ blogs, and many of them say something along the lines of what I’m about to say: I never thought I’d set up a blog. I feel kind of sheepish asking others to humor me by visiting it. Nonetheless, here it is…we’ll see what this evolves into. I’ll post on a variety of things that catch my attention. If they catch your attention, too, I really hope you’ll comment. (Then maybe I won’t feel quite as sheepish!) And between you and me, I’m also using this to challenge myself to dust off my writing habit (poetry, etc.). At times some of those writings may appear here as well. For now, thanks for visiting, and I hope you check back soon! P.S. : I hope you take a second to weigh in on my (ahem) purely scientific poll on the left.